The Philadelphia Eagles utilized a strong defensive effort and overcame the loss of All-Pro offensive tackle Jason Peters in defeating the San Francisco 49ers on Sunday, 33-10. 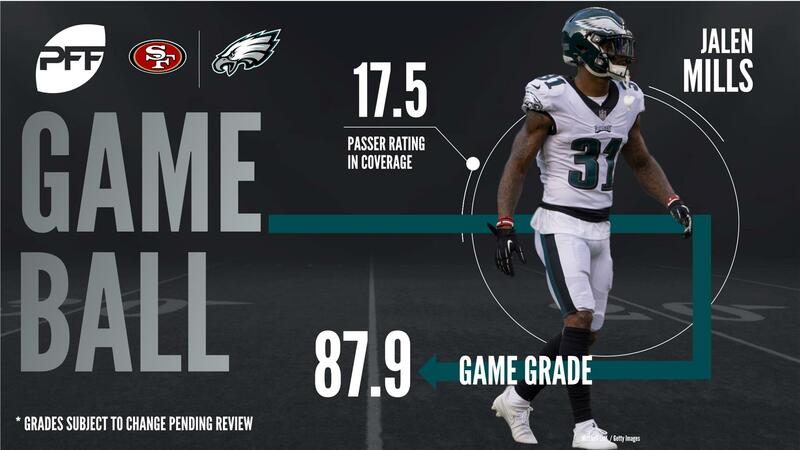 Cornerback Jalen Mills returned an interception for a touchdown to give the Eagles an early 17 to nothing lead, putting them in command early. Quarterback Carson Wentz connected for two touchdowns through the air, LeGarrette Blount punched in a 12-yard score early in the fourth quarter, and the Eagles defense held the 49ers to just 238 total yards of offense. San Francisco saw a glimpse of what could be if they stick with rookie QB C.J. Beathard throughout the rest of this season, as he connected with fellow rookie RB Matt Breida on a 21-yard score in the third quarter, the first touchdown of Breida’s career. With that, we give you our PFF exclusive takeaways from the contest for each team. Wentz had mixed results throughout the day, missing opportunities for big plays on a number of intermediate throws, throws we’ve been accustomed to him hitting this season. Alshon Jeffrey was able to bring down a 50-50 ball on Ahkello Witherspoon, taking it 53 yards for a score. Wentz’ lone big mistake on the day came when he forced a throw to Mack Hollins after seeing him stop his route early and Witherspoon made him pay with an interception. Wentz was under pressure on 10 of his 37 dropbacks, going 0-of-5 and taking 4 sacks. The Eagles running game had to grind it out with a fairly stout Niners front seven holding them in check. Kelce was constantly doing his job in the middle, getting movement and helping teammates on double teams. Overall Kelce ended up with a 93.8 run grade and was a nightmare for the Earl Mitchell all game. The Eagles pass-rushers took advantage of an injury-decimated 49ers offensive line. Already missing their starting right tackle, San Francisco also left tackle Joe Staley during the game. Even prior to his departure, the Eagles right side defensive ends had an advantage in the run game. Ultimately, the duo combined for ten pressures and four defensive stops. Losing Jordan Hicks is a major blow to the Eagles, both because of his intangibles and his on-field production. Behind him, former seventh round pick Joe Walker struggled in his first NFL game with major playing time. He had as many missed tackles as stops (1), and appeared to bust a coverage early in the game. The little success the 49ers achieved offensively centered around the production of their tight ends. Kittle and Celek combined for 46 yards on three catches, while rookie Cole Hikutini snagged a first down of his own. Celek also ranked among the best blockers in the ground game for San Francisco, earning a 74.7 grade in that facet of play. Production at tight end was one of the few silver linings in another disappointing day for the 49ers. Witherspoon was active in throughout the game and was continuously tight in coverage. Outside of a 50-50 ball with Jeffrey that ultimately ended up being a touchdown, Witherspoon forced a number of errant throws due to his close coverage. He was able to take advantage of a receiver-quarterback miscommunication and jumped a dig route for an interception on Wentz in the third quarter. On the day, Witherspoon was targeted 8 times and allowed just 3 receptions. Douzable was disruptive throughout the game, both in the pass-rush and against the rush. He was relatively stout on the edge versus the Eagles outside zone running game, totaling five solo stops and forcing the ball back in to help a number of times. Douzable also ended the game with two sacks.